So I have been lucky to obtain one of these headsets to test out so I though it was only fair to provide a review of it. I have had the device for a week now. I have it paired to my Surface Pro 3 with Lync, Webex and Jabber installed. I then have it paired to my Nokia Lumina and my Sony Xperia Z1. The device is excellent in all aspects of my usage. For audio, web and video calls, users have reported that sound clarity is great and no background noise. The main office environment can be quite noisy at times or when working from home, if it’s a Friday afternoon, the kids might be in another room, but it blocks them out. I also like the fact that there is a free/busy light on the headset, but not everyone knows what that is about. I then use the headset either watching a video on the train or listing to music. Again the headset works very well on the train. Blocks out the other noise in the background. The only slight issue I have with the headset is that the mic arm doesn’t always sit in position when folded back onto the headband. As this is a generation one release I am sure it can be addressed. It could also be my odd shaped head, sometimes it works fine, sometimes not. 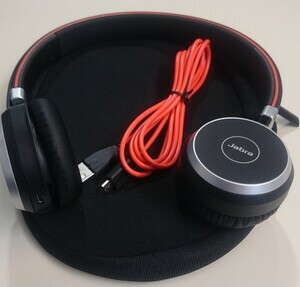 The other thing that would be useful is on one of headphones would be control for music, so forward and back say. There are already controls on one side for answer, volume up and down. As this is a multi purpose device, it would be handy. If you are looking to provide your employees with a great headset that is Bluetooth, then this is one for work, rest and play. Full details can be found here on the Jabra site.